Models for Writers remains a bestseller for millions of students for a reason: its short, accessible readings reflect the length of essays students write in college and the topics that matter most, and its simple yet thorough writing instruction offers the support they need. Abundant examples from student writing model chapter strategies and themes, showing students the value of their work alongside excerpts from published authors. Models for Writers continues to offer thought-provoking readings organized to demonstrate not only the rhetorical strategies that students will use in their own essays but also the elements and language that will make those essays effective. Also unique to Models for Writers is its versatility and flexibility: it works in a wide range of courses and at various levels. This edition includes classic texts and new selections on relevant themes such as language and race, education, democracy, feminism, scientific discovery, and technology and media from authors ranging from presidents and civil rights leaders to ballerinas and toll collectors. A new chapter on combining strategies offers model essays and instruction on using multiple rhetorical patterns, and updated questions and activities for each reading let students practice the kinds of writing they will do in college and beyond. 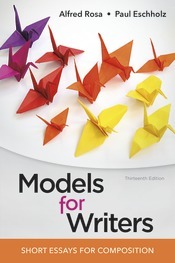 For the first time with this edition, Models for Writers features LaunchPad, Macmillan's customizable online course space, with a complete ebook version of the text and auto-scored reading comprehension quizzes, plus an array of new materials, including LearningCurve adaptive quizzing, multimedia tutorials, and other resources that you can adapt, assign, and mix with your own.